Has your printer stopped printing? This always seems to happen as you try to print the boarding pass for your Caribbean cruise. Please try these five checks first before you kill your printer. Several things can fix printing. Some are easy simple checks and others are more complicated. This article presents the five things you can do to repair printing. After that, you are free to get a hammer, take out your frustration on your device, and buy a new cheaper one. We begin here first, with the simple easy checks and then progress to the more complex issues to resolve. Check 1: Printing devices must be powered-on to print. Please make sure that the power is turned on and that the power-on light is lighted. At this time it is best to make sure that all cables are plugged into the device and that there are no error light indicators on. A quick check of the paper tray and paper hopper is in order as well. These should have a sufficient supply of fresh paper in them. Check 2: Please make sure that you are using the printer you are expecting. To verify this when using Microsoft® Word, please click on the upper left menu item "File" and then "Print" from the drop down menu. This reveals the printing panel to the right of the drop-down menu. In the printing panel on the upper left is the print button. Immediately below that, the printer is identified. If the name of this device is not the printer you are expecting to use, there is a triangle pointing down on the right-hand side. Clicking on this triangle reveals a drop-down list of printers to which your computer can send the document for printing. Please make sure you have selected the printer that you expect. There are similar selections other computer programs that permit you to verify and to select the printer you wish to use. You can print on a different printer as a test. When the document prints on the other printer, your printer has the problem. This helps you identify precisely where the problem is, either hardware or software components. Check 3: Please verify that the documents waiting to print are not stopped and held up in the print queue. When a printer encounters any problem printing a document, it just stops printing. Any document that is subsequently sent to the printer cannot be printed until the previous document is completely printed. Printers print one document at a time. This is similar to cows crossing a stream. If the first cow comes to the stream and does not cross, all remaining cows wait in line to cross the stream behind the first cow. If the first cow does cross the stream, the other cows follow. When one of the other cows refuses to cross the stream, the cows following it stop and do not cross the stream. Similarly, printers print all documents in the order that they are sent to the printer. If the ink runs out, if there is a paper the error, or if there is some other malfunction that stops a document from printing, that document and all remaining documents will stop printing. After the error is corrected, the document may or may not automatically start printing. Sometimes you must restart the document printing for that document and subsequent documents to print. The printer document waiting line on Windows 7® is found by clicking on the "Start" button and opening "Devices and Printers". In the "Devices and Printers" window you select the printer you are using. Clicking the right mouse button opens a pop-up menu from which you select "See what's printing". This opens the printer queue. If there are no documents listed, then Windows® believes that all documents have been sent to the printer and printed. Sometimes a printer is set to work offline. In this event nothing can print because the device is offline. When a printer icon is colored light gray, the printer is likely set offline. In the "See what's printing" window, clicking on the "Printer" menu item produces a drop down menu. The "Use Printer Offline" selection appears about three lines from the bottom of this menu. Since Windows 7® is context sensitive and displays only the possible menu selections appropriate, the "Use Printer Offline" menu selection is often not visible. To place the device online, please un-check the "Use Printer Offline" menu item. Check 4: Many printing problems are caused by the loss of connection between the computer and the printer. To check the printer connection on Windows 7® you again click on the "Start" button and open "Devices and Printers". In the devices and printers window you select the printer you are using, click the right mouse button to open a pop-up menu, and you select "Printer properties". The printer properties window should open on the "General" tab. In the lower right should be the "Print Test Page" button. Clicking on this button is a quick way to test whether the computer is connected to the printer. It should immediately print a test page on the printer. If it does not print a test page, then the link to the printer may not be functioning properly. To verify the computer's connection to the printer you select the "Ports" tab. The "Ports" tab identifies the port that connects the computer to the printer. When the printer is connected by a USB cable to the computer, the port label identifies a USB port. Sometimes unplugging a USB cable and plugging it into a different USB port re-establishes the connection between the computer and the printer. Driver programs connecting Windows to the printer port may not be functioning properly with Windows. In this case reinstalling the latest printer driver programs can resolve this issue. The driver programs must typically match exactly the version of Windows on the computer. Often separate driver programs are used for the 32-bit and 64-bit versions of Windows®. The latest driver programs are found at the printer manufacturer's website. If the printer is a network printer, a standard TCP/IP port is checked. A TCP/IP port connection can be broken when the incorrect printer IP address is used. To reconnect the printer to the computer, make sure that the IP address on the computer is the same as the IP address assigned to the printer. When the printer is a wireless printer, verifying the connection becomes more difficult. Similar to any other network connected printer, a wireless printer must have the IP address match the address used by the TCP/IP port on the computer. Sometimes the printer may be identified by name and not by IP address. If the name is correct, a test page should print on the printer. When a test page does not print, the most direct resolution of the problem may be re-installation of the printer. This would require the original printer installation CDs or a download of the installation software from the printer manufacturer's website. Check 5: Wireless printers often lose their connections to the network. This can be verified by going to the printer and selecting from the printer menus a print out of the network configuration. An alternate test is to use a different computer to print a test page to the wireless printer. When a wireless printer has lost its connection to the network, the simplest and most direct solution may be to reinstall the wireless printer on the network. This again would require an installation CD or a download of the installation software from the manufacturer's website. Wireless printer installation differs from manufacturer to manufacturer. Some printers require an active USB connection into the printer to complete wireless network installation. Other printers can be installed without such a USB connection. Wireless installation requires knowing the network key or password. Sometimes the latest Wi-Fi Protected Access (WPA) security must be used for the printer to connect into the wireless network. The older Wired Equivalent Privacy (WEP) does not permit some printers to connect to the network properly. Performing these five checks should at the very least identify where the problem lies. You should be able to then zero-in on the root of the problem. If a printing problem is caused by physical damage, it is sometimes, but not all times, not cost-effective to repair the printer. In this case it is best to get out a big hammer and take out all your pent-up frustration on the device. Next go to the store and buy a newer, faster, and better one. A copier machine is commonly used in offices and school places as they provide copying purposes that is part of these community structures. Xerox Corporation presented the first in the year 1949. Photocopy machines were widely known as Xerox machines back then. 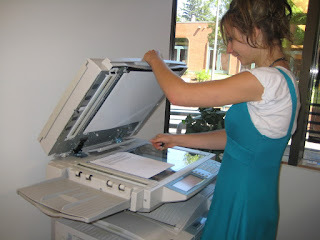 Nowadays, copier machine apparatus' are more advanced though. Top quality machines can provide high-grade photocopying tasks such as copying colored materials like photograph pictures. Manufacturers continue to develop more useful copy machine models to meet the growing demands. Copier machine equipment is ordinarily found in every office corner. Most offices prefer to use digital due to its ability to save more time and make employees work more productively. 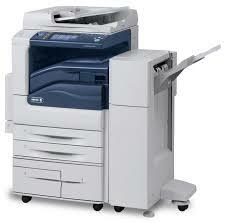 One type of copier machine is the Kyocera M2040DN. It is designed for small spaced offices. This model comes in desktop size printers. Despite the size this machine has, it also has 600 dpi PC Printing, electronic sorting plus standard color PC scanning features. The M2040Dn can make 42 document copies per minute and can produce, at most, 99 document copies if placed in continuous copying setting. All in one printers are the latest models produced by different manufacturers. 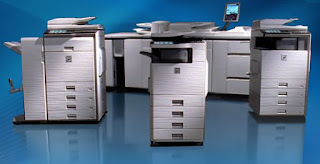 These machines provide Fax printing, document printing, scanning and photocopying tasks. The design was created to deliver the most commonly used equipment in one package and thus, increase productivity levels using such machines. HP LaserJet M1319f MFP is an example of the latest all in one printer manufactured by HP. This machine provides scanning, faxing, printing and copying services. This equipment is both a cost-efficient and time efficient investment due to its multi tasking abilities. This machine can print a maximum 8000 pages per month, make 99 document copies per day and can hold up to 500 pages of 8.5x11 size fax memory. Personal machines provide the portability of convenience and ease of access. Personal sized copiers are tailored small and light to allow users to move around and still access their copiers without any hassle. Canon PC170 copier machine is an analog copying device that can fit in small spaces. The size of this equipment is 32" width and 4.5" height. It is comparable to the usual flat DVD player. Personal Copiers like this makes copying services available at home and places the user wish to go. A copier machines is one of the many great contributions of technology that help improve lives and create quality living. This company is situated in the center of Illinois. It is also close to the Cook County. 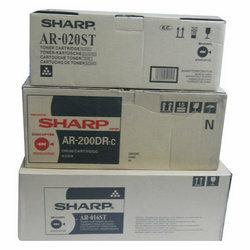 It provides low prices on compatible remanufactured copier toners, toner refill kits and laser toner cartridges. The company sells a variety of laser cartridges with an easy interface and secure online ordering. This company supplies the widest variety of Lexmark laser cartridges, HP laser cartridges, MICR toner cartridges and Canon copier cartridges. 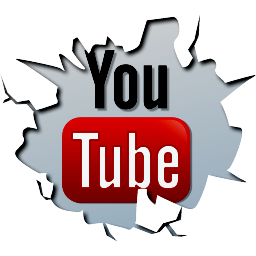 It also provides products for fax machines, laser printers and other photocopiers. Make sure you follow a few tips on how to replace a cartridge. Buy a replacement for destroyed or old toner cartridge. A cartridge in your printer must have several identifying type information on it, including the part number which you could use to distinguish the type you need. As it starts to run low, several printers will launch a message to your computer which includes the part number for a replacement. You can donate your old cartridge to an office supply store. Several office supply stores will give you a store coupon for every cartridge that you donate. Think of it as helping your environment. Remove the destroyed cartridge. You may need to snap the toner out of position. Follow the instructions given to your printer if you have a hard time removing the destroyed one. Wear old cloth when replacing toner cartridges as the spills might stain your shirt. Get the new toner cartridge out of the box. Rock it back and forth several times. 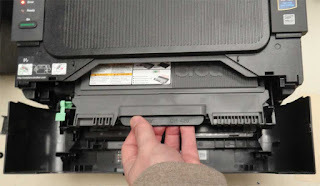 Remove the protective cover and snap the new toner into position. Close your printer cover if you installed the cartridge correctly. 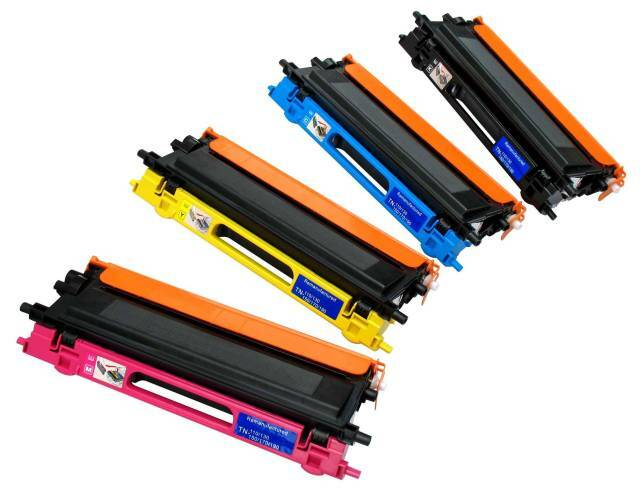 Your printer may need to be aligned after replacing the toner cartridge. Follow the instructions given by your printer for this type of task. In the excitement of starting their own work from home business, some people overlook a crucial aspect: office equipment and supplies. Many home-based businesses rely on paper and using the computer printer to make copies is often not feasible. Investing in a high-quality copier and some toner cartridges is recommended for any home entrepreneur who will be duplicating documents. While taking care of the legalities of starting a business, the individual should develop a list of required office equipment and supplies. Even if the person has a computer, it might not be adequate for business use. In some cases, only software upgrades will be necessary while in others, a new system will be needed. Now is a great time to buy PCs and laptops because back to school deals are advertised everywhere. A compatible printer should be included on the equipment list. The latest styles feature wireless print capabilities, allowing printing to take place anywhere in the home. When purchasing a new printer or getting the current one back into shape, an adequate supply of paper and ink is also recommended. Keeping some in inventory ensures there will be no down time due to printer supply shortages. Next on the list is the copier and it comes in various shapes and sizes with nearly as many features. The rule of thumb is to select one that does a bit more than is needed. This way, when the business grows, a new machine will not be required. When shopping for copier toner, look for premium compatible cartridges because these work as well or better as OEM cartridges and cost much less. Online retailers sell cartridges for major brands like Xerox, Ricoh, Canon, Konica-Minolta and Toshiba. Pens, pencils, paper, filing cabinets, hanging files, folders, a stapler, and a calculator or adding machine are supplies that every home business owner should purchase. Binders keep hard copy documents organized on shelves and in closets. Do not forget the three-hole punch because without it, getting those papers into binders will be difficult. With a shopping cart filled with everything from staples to toner cartridges, the new home business owner should be prepared for any situation. Setting up a home office is fun but it is also a strategic exercise because furniture and equipment should be positioned to streamline workflow. Once everything is in place, the new company will be ready to open its doors for business. Why Do People Prefer Remanufactured Cartridges Over Compatible Cartridges? One of the most important office machines is the printer! Imagine a day without printers, computers, fax machines etc. they can be Chaotic and frustrating right? In fact it can mean a stump in revenues also. Whether office or educational institution, these machines have become a part of our lives now. Hence, it is imperative that we take care of these appliances and machines. We need to understand their components, their service mechanism, need to be in touch with customer care and suppliers, and above all respect all the parts and take care of the same. Mainly there are 3 types of printer cartridges - OEM, Compatible and Remanufactured. One of the 1st cartridges to hit the market bearing brand names was the OEM ones. They are costly and standardized; but many customers want cartridges which are specially manufactured to meet certain requirements and exceed beyond the OEM ones. These are the compatible ones. 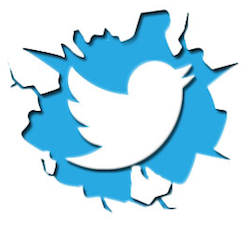 They are customized to meet specific client needs and hence are not branded like Exxon, Canon etc. they are manufactured by third parties and not the actual manufacturers. They can either be 100% compatible or less. If the cartridge is 100% compatible, it will be able to function with any kind of printer. This means that 100% compatible cartridge is recognized by any printer and hence will function smoothly. If the cartridge is not a 100% compatible cartridge, then some printers may not be able to recognize it and the functioning might be hampered. That is the main problem with compatible cartridges and faced by many customers. Hence, they are not really the first choice by most people. Compatible cartridges can sometimes be even more expensive than either OEM or remanufactured ones. The main difference between compatible and remanufactured is that compatible is made by assembling new parts where as re manufactured is made by using the already serviced parts. Remanufactured cartridges uses already serviced parts but go through a battery of tests which ensures supreme quality! Remanufactured cartridges have a fantastic combination of price and quality. Just because it is cheaper, that does not mean they compromise on quality. Quality is supreme, but at affordable prices - which is what is most attractive for all customers! It is thus, essential to make a prudent choice between different cartridges, printers and toners. Remember they are the life line of your organization. You do not want your work to be hampered. 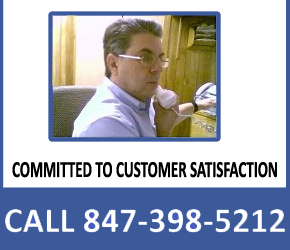 Visit us at ctcopier.com for more information and excellent customer service. Our experts will help you make the right decision. You are not alone, we are here for you! No matter how good your printer is there is one thing it will always need to work properly: toner. The toner in your printer is stored in a specially designed printer cartridge and when the toner runs out this printer cartridge must be replaced. Printer cartridges can vary widely in price but fortunately you have many options to choose from. More likely than not when you first purchased your printer it came with a specially designed printer cartridge manufactured by the same company that built your printer. 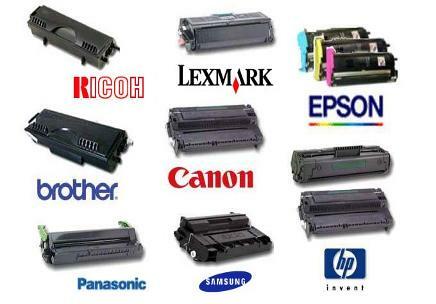 Every printer is different and thus the cartridge needs will always vary. Printer cartridges manufactured by the same company as those who built the printer are referred to as OEM or Original Equipment Manufacturer. Sometimes they are also referred to as Genuine OEM. There are some advantages to replacing your toner with an OEM printer cartridge. You will be sure that the cartridge will fit your model printer, as well as be sure of the quality. Unfortunately there is also a heavy price to pay with OEM printer cartridges, as OEM toner is usually fairly expensive. If price is a concern there are other options as well. Your new printer cartridge does not necessarily need to be manufactured by the original printer manufacturer in order to work. There are several companies out there that specialize in making compatible printer cartridges, that is, cartridges which are compatible with a number of different printer types from different companies. The main advantage of a compatible printer cartridge is that it will be somewhat cheaper in price. They can often run for as much as ½ the price of its OEM counterpart. Most compatible printer cartridges will work just fine with your printer, however in rare instances a compatibility problem might arise. Generally they are manufactured roughly the same as the original OEM printer cartridge, only it is manufactured by a different company. The last option for buying a replacement printer cartridge is to buy it remanufactured. This is something made available by a number of companies in the business of recycling printer cartridges. They take the old cartridges and rebuild them, as well as replacing the toner. Both OEM and compatible printer cartridges can be recycled and remanufactured, and will vary in price depending on the price of the original cartridge. Remanufactured printer cartridges are popular not only because they are a cheaper alternative than OEM, but also because they are more environmentally friendly. It cuts down on the need for new cartridges to be manufactured, as well as cutting down on the number of discarded cartridges taking up space in landfills. Once you have purchased your replacement printer cartridge (or refilled your old one) it is time to put it back into your printer. Most printers will have instructions printed right on them for how to replace the printer cartridge, or you might need to consult the manual. Once your new cartridge is in you are ready to start printing again!